I’m calling this one “the little wine that could.” This was a total impulse buy – I saw it was on sale at Harris Teeter and I needed a non-glass bottle to take with us to our mountain house for a picnic. I’ve had some good luck with Rex Goliath before, but I didn’t see the Zinfandel in this box version so I went with the Cabernet Sauvignon. I don’t usually go for Cabs, so I didn’t have a lot of expectations going into it – I was totally delighted. It had a dry bite to it, but it still managed to have a bright fruity palate. The first day I sipped it solo and noticed lots of spices and a hint of oak. I came back to it a few days later, and paired it with some homemade pepperoni pizza. After a few days of being open, fruits of cherry and blackberry stood out more to me. I liked it more after a few days of breathing, but my husband with a drier palate, like it more the first day. 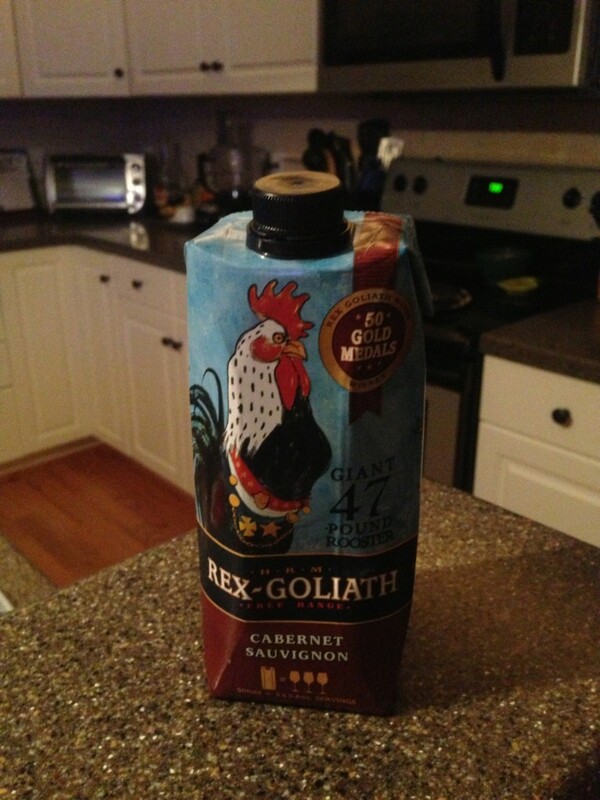 Overall, it’s another great value-priced wine from Rex Goliath. It’d be a great wine to bring to a cookout or pot luck, or one to grab on a night when you’re going to put your feet up, catch up on The Mindy Project and eat popcorn for dinner. (What? Like you haven’t done that…) Overall, I was totally happy with this wine and extra happy to learn that maybe I like Cabs more than I thought! Looks like I better try more. Would I buy again? I would! So far, I’m having good luck with Rex Goliath. Pairs well with lean cuisine and cheetos too. Love the chicken Cab!